Louis Niedermeyer, ca. 1850, Bibliothèque nationale de France. Abraham Louis Niedermeyer (27 April 1802 – 14 March 1861) was a composer chiefly of church music but also of a few operas, and a teacher who took over the École Choron, duly renamed École Niedermeyer, a school for the study and practice of church music, where several eminent French musicians studied including Gabriel Fauré and André Messager. Scene from the 4th act of La Fronde, an opera by Louis Niedermeyer. 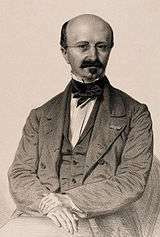 Born in Nyon, Switzerland, Niedermeyer studied piano in Vienna with Ignaz Moscheles and composition with Emanuel Aloys Förster. He studied further in Rome with Vincenzo Fioravanti (1819) and in Naples with Niccolò Antonio Zingarelli. While in Rome, he had the luck to meet Gioachino Rossini, who befriended him and urged the production of some of Niedermeyer's operas. His first opera, Il reo per amore ("Guilty for love"), was put on in Naples in 1820 with some success. 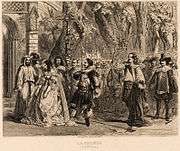 Like Rossini, Niedermeyer settled in Paris (at the age of 21, in 1823); and there, in later years, four more of his operas were staged, though with little success: La casa nel bosco ("The House in the woods"' 28 May 1828), Stradella (3 March 1837), Marie Stuart (6 December 1844) and La Fronde ("The Fronde"' 2 May 1853). Niedermeyer also collaborated with his friend Rossini on the assembly of Robert Bruce (1846), Rossini's third and last pastiche; Niedermeyer "provided the all-important French texts with their characteristic tone color and harmonies". After these attempts at an operatic career Niedermeyer devoted himself primarily to sacred and secular vocal music. In October 1853, he reorganized and re-opened the school then known as the Ecole Choron (after Alexandre-Étienne Choron, who had died in 1834). It was renamed the École Niedermeyer. Although it has had further name changes, the school is still open. His church music remained in use in France and elsewhere into the 20th century. Although he studied in Austria and Italy, he is generally described today as a French composer because of his chosen country of residence. He died in Paris. ↑ Records international note on Robert Bruce on Records International.com; accessed 21 July 2012. ↑ Smith, Rollin (1992). Saint-Saëns and the Organ. Pendragon Press. p. 63. ISBN 0-945193-14-9. Wikisource has the text of a 1920 Encyclopedia Americana article about Louis Niedermeyer.